Joshua is one of the featured artists, in the good company of Herman Leonard, Jim Morin, Patrick Farrell and many more. Below, he tells the stories behind some of the photos that are to be displayed at the gallery. American Heritage High school soccer player Miguel DaSilva (top left) poses for a picture at the home of his guardian, Joe Sagarra. 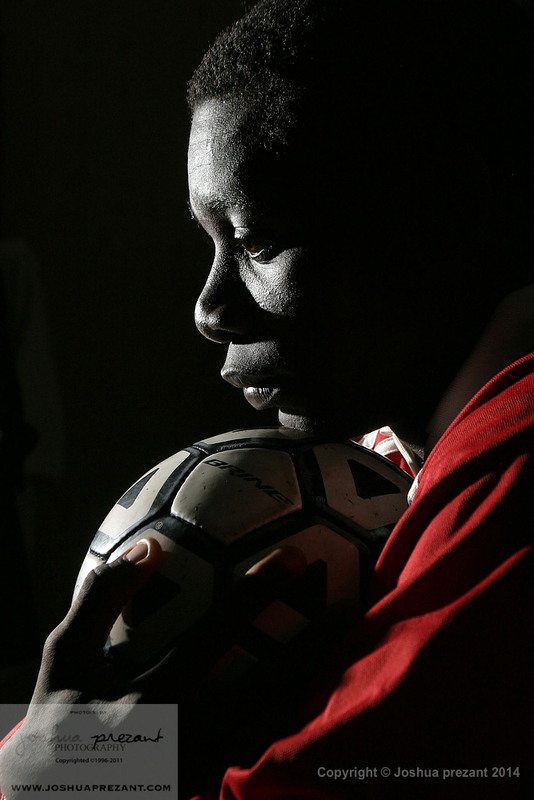 DaSilva escaped Angola after his parents were shot in front of him. After making he way to the US, he landed in an Atlanta airport on September 11, 2001. He is one of the best players on his team and is expected to go to college on a full scholarship. Having the privilege to meet and photograph this amazing kid was awe-inspiring for me. He triumphed over the most horrible obstacles that no person, let alone a kid, should have to go through. Often times, as photographers, we are art directed to get serious pictures of a subject. And other times you have a great actor or personality in front of your lens that makes it look and feel real. This was different. His pain, suffering, and triumph was really there. This was the real deal and I only hope that I was able to capture an inkling of what this strong and courageous boy carries on his shoulders every day. My goal was to show his emotional past as well as his future with soccer. Trick Daddy (top right) is sometimes called the Mayor of Miami. When you think of hip hop/rap and Miami, you first think of 2 Live Crew and then Trick Daddy. 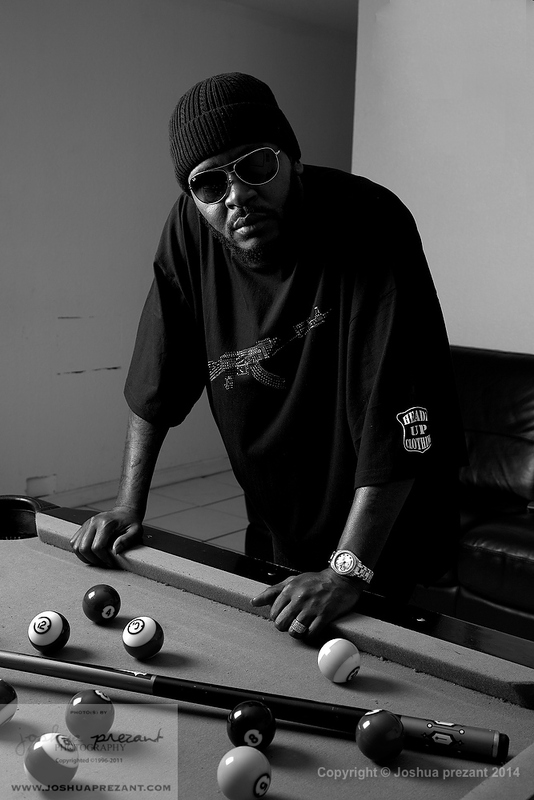 He is one of the pioneers that brought the unique Miami sounds and stories to the hip hop masses. And where 2 Live Crew rapped about partying and women, Trick was not afraid to bring the “gangster in his life” to his music. I was assigned by The Source magazine to do a spread of portraits on him. We met at his recording studio/office that he keeps in a rough area of Liberty City just outside of Miami. The guy is a bit intimidating when you first meet him. But he was extremely hospitable and easy to shoot. He was actually playing pool with some guys while we were setting up the next shot when I asked him to stand still while we got some lights in place and then fired a few frames. I love how the beat up walls and torn up pool table contrast with his aviator glasses and bedazzled AK47 shirt. Flo Rida is truly the most down to earth, genuinely nice guy. You will not find another artist who is this famous and equally laid back. The shoot was assigned by XXL Magazine through Photo Editor Mike Delfin. Having worked with Mike on previous shoots, I was given a ton of latitude to do my own thing and surprise him. 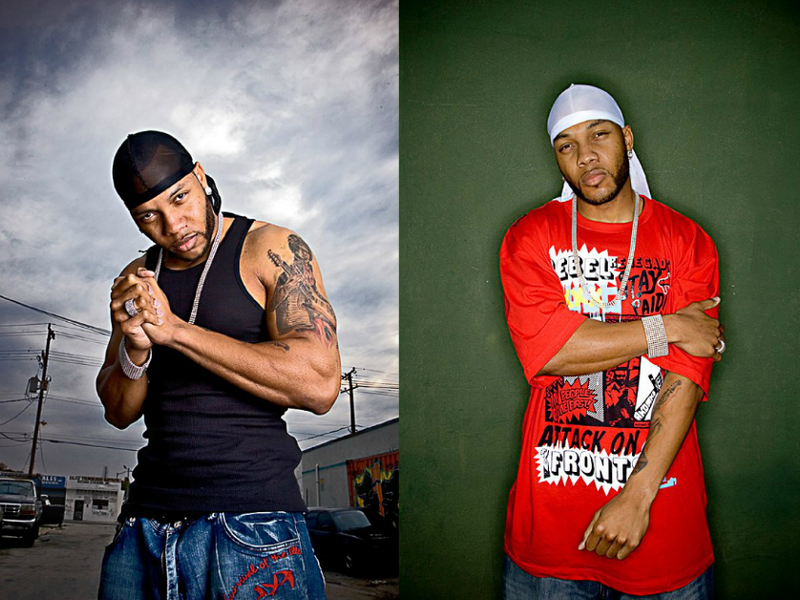 The idea was to feature Flo Rida after his album began blowing up the charts. The magazine’s only instruction was to shoot him in his hometown of Miami (Coral City) and not the palm tree-lined and sun-filled beaches. My team and I scouted a few locations ahead of time and nailed everything down. He was very easy to work with. No huge entourage, just him and two buddies. We had figured about an hour for the shoot and ended up shooting for 5 hours at several different locations. He was tremendously gracious with his time and just wonderful to work with. Being from Miami, it makes me proud that he is representing it in such a classy and authentic way. 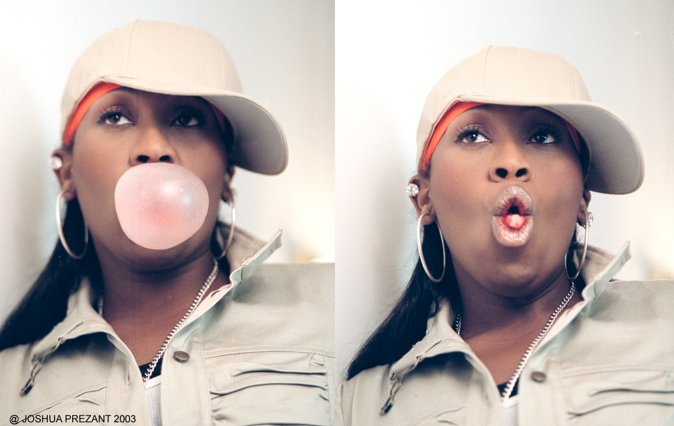 Missy Elliot is awesome. Five time Grammy Award winning American rapper/hip hop artist, singer-songwriter, and record producer. She’s the only female rapper to have six albums certified platinum by the RIAA, including one double platinum for her 2002 album Under Construction. I got to spend the day with her on the set of a video shoot for one of her artists, Monica. I was there to do portraits of Missy and Monica for InStyle Magazine. It was wonderful to see Missy as both an artist and producer. Throughout the day I observed Missy chewing gum and blowing bubbles the whole time. The gum idea was not on my mind initially. I usually try to go into shoots with some ideas, but I always make sure I can adapt and switch gears to whatever the subject or environment screams for. 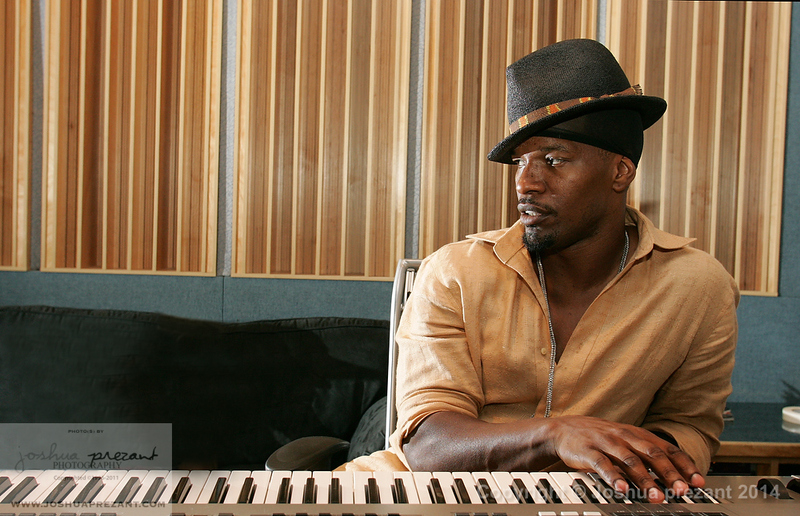 For Jamie Foxx’s portrait, I was on assignment for Entertainment Weekly. Jamie was working on his first record. The idea was to show Jamie the musician, not Jamie the actor. The shoot took place at Circle House Studio in North Miami. It was interesting to see Jamie and his crew work together to formulate lyrics for his songs. It was a wonderfully creative group effort. My assistant and I ended up hanging out the whole evening listening to his record being formulated and tracks laid down. The man is truly a talent. Shades of Black, Colorization of the Americas opens at 7pm tomorrow night at the Little Haiti Cultural Center of Art at 212 NE 59th Terrace in Miami. For more of Joshua’s work, check out his website. The other day Joshua Prezant Photography got called in to photograph a rising star in the TV media world. Alicia Menendez. She is one of the faces that Fusion TV is banking on to bring in the millennial folks to the newly built English-language channel from ABC and Univision. 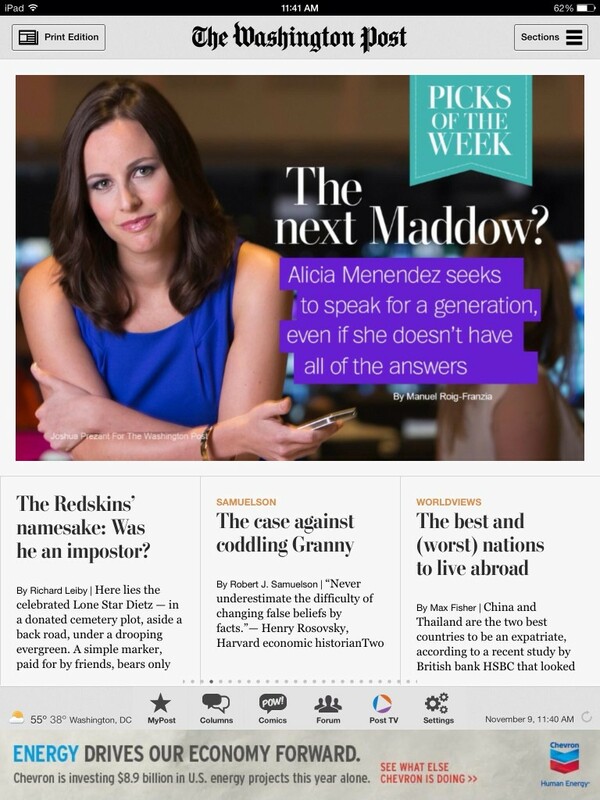 The instrcutions from one of my favorite clinets, The Washington Post, was simple and usually what I get from them. Have fun and shoot something cool. Although this time I did have one request. Nothing behind the news anchor desk. So after a quick google search of Menendez I was on the phone with her wonderful people at Fusion. They were extremely helpful and we set up a shoot time. Having been in many newsroom over the years ( both TV NEWS and Newspapers) I had an idea of what I would be working with and started to visualize ideas. But nothing I thought of came close to the vision of what this newly contructed 160,000 square foot studio in Doral, FL looked like. It truley was a amazing site with all the new technological toys one could thing of that would be in a digital newsroom built from the ground up. So off I went scouting the location when I arrived at the shoot. After scounting I met up with Menendez for a quick introduction. Witin seconds of meeting and talking with her I knew I would like her. And I did. Menendez was very friendly, and not the friendliness that most TV personalities put out there. She did not come off eager to be liked or to be put in a mold of who she was supposed to be. She was just herself. For good or bad. She had a smart intelectual humor that mixed in equal parts of the ever so slight mix of good rounchiness and “geek” humor. And you can see it in her slight wise cracking “this is who i am” smile that came out in the photos. It was a great shoot and the article by writer Manuel Roig-Franzia came out wonderful. I wish Alicia all the best on her new gig. Growing up I had the opportunity to go a a bunch of boxing events throughout Florida. This was in a time when Miami Beach was still a fight center in the boxing world. Through my father’s Uncle I was able to not only see some of the great match ups that came through Florida, but to also meet the boxers and promoters. As a young kid I thought that this world was amazing ( much to my mother’s dismay). So anytime the opportunity arrises to photograph something boxing related I jump at it. 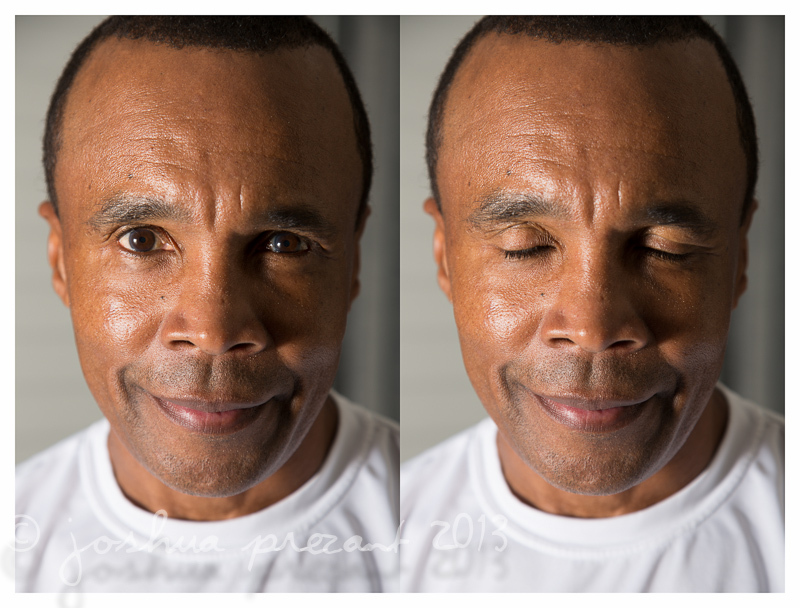 When Joshua Prezant Photography got the call to photograph legendary boxer and Olympic gold medalist Sugar Ray Leonard I made sure to clear the schedule to make it work. Right away my mind started to go wild with all amazing things I wanted to try to do photographically. But then I soon learned that I would be photographing him for a story not necessarily about boxing, but for a different fight that he took on. He was helping to shed light on a dark time in his life as a teen when he was sexually abused by two people very close to him. I had to work with what I had. Plus, how much into a photo shoot would he be after being interviewed about his abuse for an hour or so. As I was setting up the lighting I carefully listened to his story as writer Wayne Coffey interviewed him. After they were done, it was nearly 10:30 pm or so. 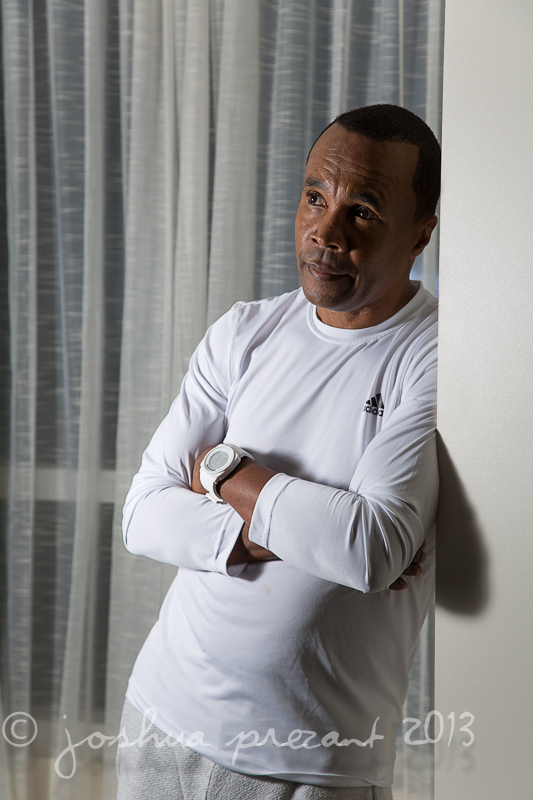 To my amazement Sugar Ray was truly hospital and easy going when we started shooting. 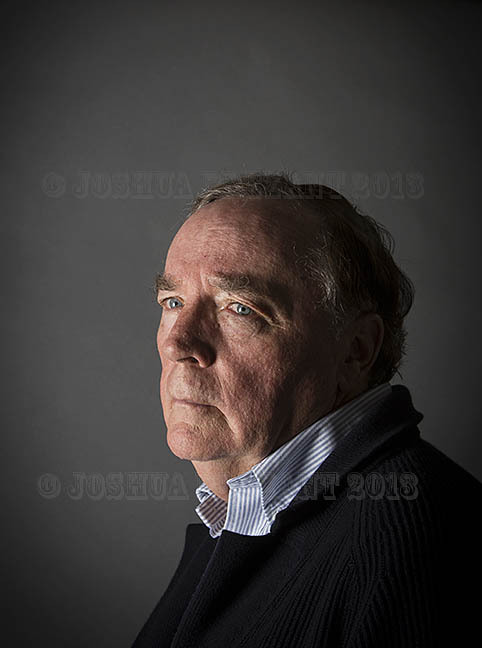 Although we did not have much time and after what had to be an emotionally draining interview he patiently sat for my photo session…. Even allowing me to get a more upbeat idea in before we ended. Latley Joshua Prezant Photography has been getting a lot of love from the UK. Two differnt project in the same week that came from different clients in the UK. Always a pleasure working with our English speaking counterparts…aside from the time zone difference. Thankfully there is a App for that. Currrently our cell phones and computers have the time zones and current times for about 5 different places around the globe that we regularly do business with. It is not uncommon to wake at 5AM to check emails from the clients speak to the about the projects we are working with. Our lastest client was Sony Records UK. 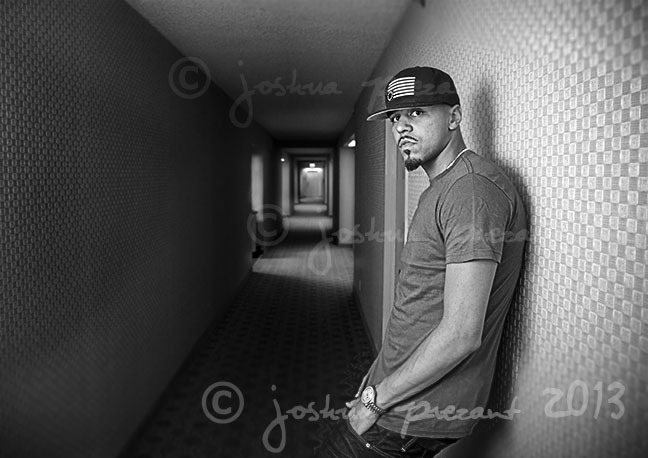 We were contracted to photograph Hip Hop artist J. Cole for a promotional shoot after the launch of his world tour that started in Miami. And When I say after…. I mean at 2 am. It was a quick shoot and we had to work with the location we were given as we were photographing him right after his concert and right before he hopped on his tour bus to head to Orlando for the next stop. Oh, I forgot to mention that it was also in bentween a intervew with a print journalist. We ended up in the hall way of the Hyatt Regency Miami having to be very quite as we were shooting after 2 Am with guest of the hotel fast asleep. We had to work with this as every other location around was filled with fans spilling out after the show. Usually this can make for a rushed ( or should I say more rushed) shoot. 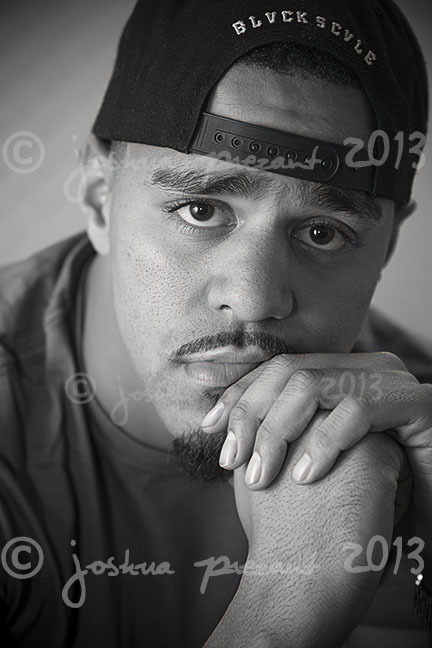 But luckily for us, J.Cole remebered Joshua from an early shoot about a year ago for FHM Magazine out of London. He seemed happy to see a familair face and already had that important trust in the photographer that is needed for a successful shoot. I look forward to round 3 and round 4 with J.Cole. He is an extremely articulate and friendly individual. I with his much success of his new tour and album. On a beautiful sunny, and unusually breezy day in South Florida I found myself driving down a two way road with gigantic mansions on the left and nothing but sandy beach and ocean to my right. 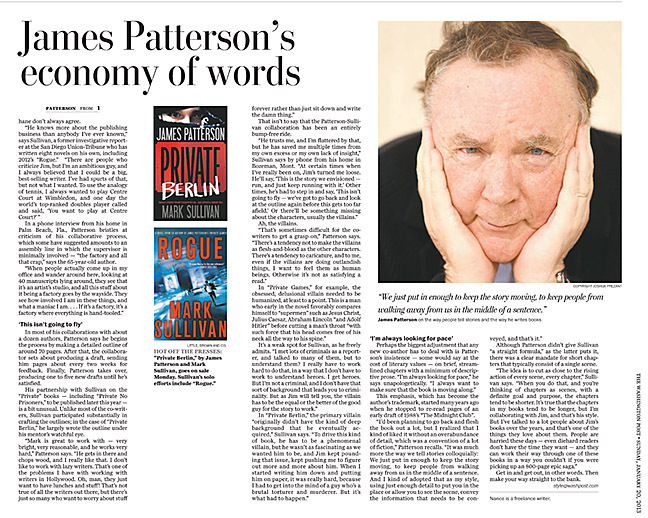 I was headed to the home of the prolific writer James Patterson. 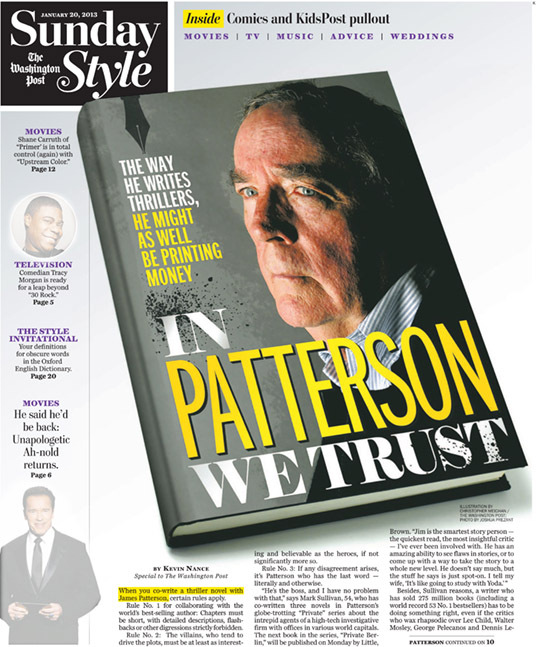 I was on assignment for the Washington Post Media Company to photograph James for the cover of their upcoming style section. When I entered into his home I was immediately in awe. Not because of the big house or the location, but because of the amazing collection of photography that he and his wife had. And when I saw the picture of James on his mantle with a signed note at the button from your pal Harry ( as in Harry Benson) I got a tad bit nervous. First off, he knew what a good picture was and second off he was pals with some of the best photographers out there. If i screwed up, I would be getting called out by the likes of Harry Benson and Elliot Erwitt! The assignment called for a very clean background with an emphasis on James’s eyes. I had about 15 minutes with him, mostly talking photography in between shots. It was a real treat for me to photograph a subject with such a passion for photography. 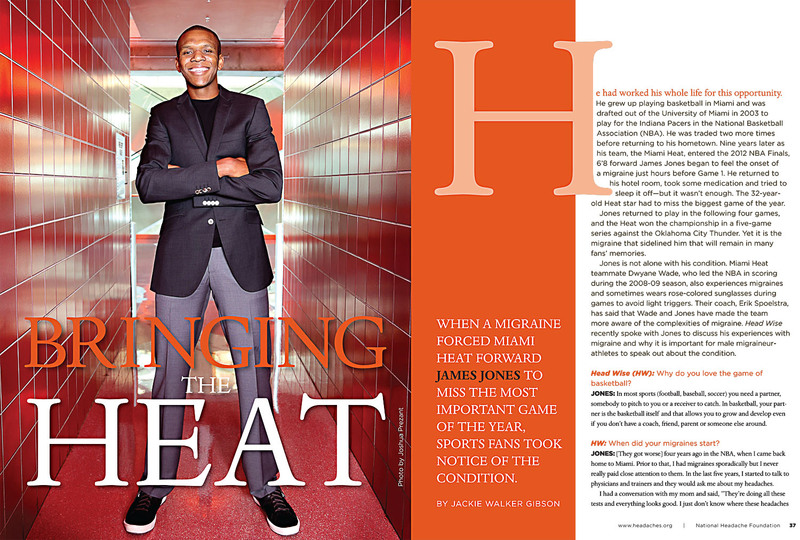 A recent magazine cover shoot with the Miami Heat’s James Jones didn’t go as planned…But came out red hot instead! 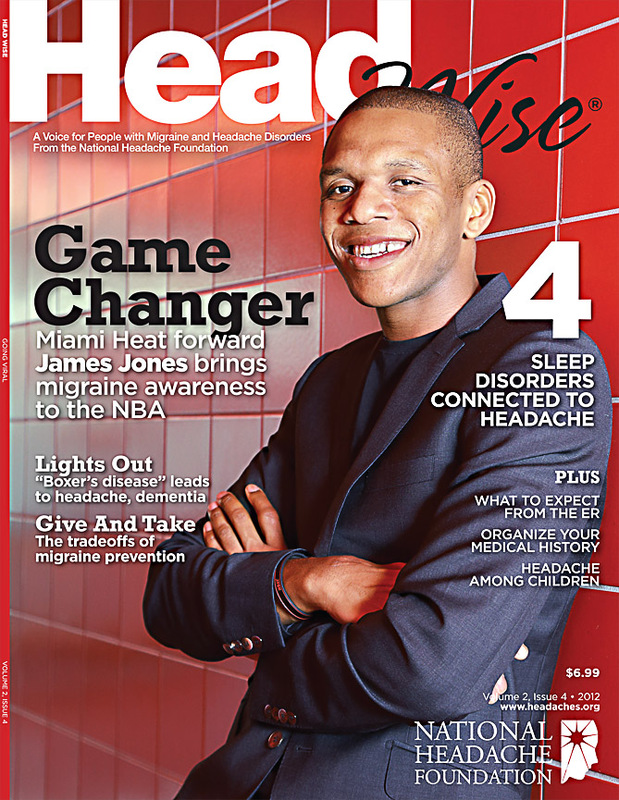 When the magazine Headwise called Joshua Prezant Photography and said they lined up the Miami Heat’s forward James Jones to be on the cover of their magazine I knew the shoot would have to be quick and squeezed into the very busy schedule of the basketball team. When the team is in season the players have very little time for anything but basketball. So having worked with many professional athletes over the years I knew things have to be ready to go and in place well in advance of the actual shoot. As usual with shoots like this the first step is to start coordinating with the teams PR representative to come up with a date, time, and place for the shoot. After finding a day that worked for the team and my crew the next step was to scout the location. The magazine ideally wanted him overlooking the water with something that screamed said Miami. A few days before the shoot we scouted the location at the American Airlines Arena in Downtown Miami. We would have to shoot at the Arena where the team played and practiced because right after practice was the only time James Jones had free. A perfect spot was picked on an outside balcony and a platform to raise James Jones safely above the rails were ordered up and electrical outlets double checked. And as any good photographer knows, you have to plan for backups just in case of anything. So we scouted some backups and have a plan B and place C ready. The day of the shoot my team and I arrived three hours ahead of the shoot time given to us by the team to get set up and ready to go. As these things generally go, the shoot time kept being pushed further and further back because team practice was going longer then expected ( and no. You can’t just have the PR guy tell the coach we need one of his players now!) And sure enough with this being in South Florida and all right as the player arrived for the shoot fresh out of the shower a sudden heavy rain band went right over our outside set up. We had no time to wait out the rain as the player had to get his kids in 10 minutes. We thought we had 20 minutes with him! But we were prepared for anything and my team and I kicked into gear and got everything ready to go inside and made some great shots. It was not what we all were expecting, but the client loved the pictures and so did the subject.